I haven't been to the seat outside the Gala Casino for a while as I'm trying to deal with my 'seat obsession'. However, a few days ago I found myself back there. I ended up having conversations with two separate people who had come outside for a break and a smoke. The first conversation was with a young man in his early twenty's. Just to be friendly, I said that I hoped he was winning more than he was losing. As the conversation developed, I found out that he came to the Casino once a week to play Blackjack, and he limited himself to £20. Apparently, he had a short while before won £100, and went and spent £80 of it on a gold necklace for his girlfriend. He was back to see how he would get on with the money he had left. He seemed genuine in his daily limit, but I didn't have the heart to ask him how much he had lost to win that £100. The second conversation was with a lady around my age (now don't be nosy). She came to the Casino two or three times a week to play Roulette, and has done so for the last two years. According to her, she never wins, and never has done. She said nothing about limiting herself, or about how much she has lost over that period of time. I can only image that it could run into thousands of pounds. I wanted to suggest that perhaps Roulette wasn't her game, but I didn't. All I asked her was why did she keep playing if all she did was lose? Her answer was typical of a gambler. "One day my luck will change". Unfortunately, millions of people are doing similar things. The proliferation of Bingo sites and Poker sites advertised on Television, mean that you don't have to move from your own home to lose money. The gambling sites feel that they have satiated themselves as to the morality of their actions by placing the 'gambleaware' web address in small print on their adverts. Millions of others would resist the description of gambler, as they fill in their Lottery, Euro Millions and an endless range of scratch cards. I've known some people who spend upwards of £50 a week on this winning dream; others of course stick to a pound or two. The fact that the odds on winning the Lottery is about 14 million to one, is not an issue, because "one day my luck will change". I have looked up some ridiculous websites that claim to help people to change their luck. Many are associated with white witchcraft, and advocate spells to get rid of bad luck. Some are just too embarrassing for me to bring myself to mention, but here's one (which if you plan to use, you seriously need professional help). when the moon is next to be full'. Worked for me and I'm in great shape now". Well good for you, but what a load of old cobblers. Yes, I know that there are people who win vast sums on the Lottery, and that there are those who win in Casinos, but they are a tiny percentage of those who constantly lose, and whose lives are blighted forever. What do all of these people have in common? They are chasing rainbows. Trying to achieve something that is not possible or practical. Too many would echo the words I saw on a T-shirt in town the other week, "I've been chasing rainbows all of my life". What is a rainbow? It is "a spectrum of light that appears in the sky when sunlight is refracted through rain drops or other drops of moisture in the Earth's atmosphere". 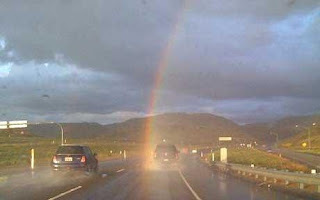 The picture opposite seems to capture the end of a rainbow. It was taken by Jason Erdkamp on the 13th February 2009 after a storm in Orange County, California - but there was no pot of gold. There are myths surrounding rainbows throughout the world, and perhaps the most popular in the English speaking world is that a Leprechaun can be found with a pot of gold at the end of a rainbow. It hasn't happened because it doesn't exist. Light is not something that you can feel in yours hands, like rain or fire. It cannot be grasped, therefore it is pointless chasing it. Gambling, as a form of chasing rainbows is an emotive issue to me. I spent too many years working with people who had this 'addiction', and saw its destructive influence on their own, and their families lives. For every winner, there are thousands, if not millions of losers. 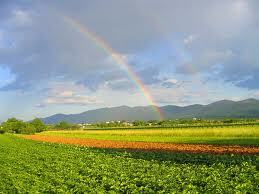 The Lottery perpetuates this chasing of rainbows through the words, "It could be you". I'm not totally opposed to what some call "a controlled harmless flutter", it's just that it doesn't always stay like that, and the 'harmless flutter' gets out of control, and no one can predict if, or when that will happen. 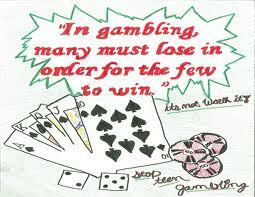 Gambling in one form or other has been with us it seems forever, and I'm sure that will be the case forever. My aim has not been to preach, but I guess to warn. I can't be a libertarian and then deny people the right to make fools of themselves. Let me leave you with two quotes. "The safest way to double your money is to fold it over once and put it in your pocket". "Depend on the rabbit's foot if you will, but remember it didn't work for the rabbit".